Corruption is not a new phenomenon and is a term that has many meanings. Tiihonen argues that corruption “is commonly understood to be bribery, and accepting a bribe, and other unjustified influence, by giving and receiving benefits. A usual list of corrupt acts includes bribery, extorsion, influence peddling, nepotism, fraud, speed money, and embezzlement” (2003, p.5). Corruption is a phenomenon which undermines public governance and principles of responsible management, and therefore citizens’ life quality and well-being as well as their trust in public officials and institutions. Among others, effective enforcement of public values, institutional ethics and personal honesty and integrity inculcation are a means of containing corruption within acceptable limits (Caiden, 2001). In the last decades, governments and international institutions and organizations have drafted and formally adopted standards of professional conduct, ethics codes and charters for individuals holding public office (CNFPT and IASIA, 2018). For instance, in 2001 the European Union has adopted “The European Code for Good Administrative Behavior”, and then in 2012, “ The Public service principles for the EU civil service” through the European Ombudsman; similarly in 2013 the United Nations have adopted the “Standards of Conduct for the International Civil Service, International Civil Service Commission”, and in 2015 the Sustainable Development Goals where Goal 16 focuses on institutions and several of its targets encouraging the fight against corruption and building effective and transparent institutions which serve the citizens. Adopting legal frameworks and “soft laws” in the form of behavior standards at national and international level is crucial. Nevertheless, greater attention must be given to the implementation, monitoring and improvement processes. In many countries there is a general belief that corruption is part of the human nature,, “it is in the blood,” whereas in others it is a matter of choice, rule of law, education and transmission from one generation to another of what is right and wrong (Caiden, Dwivedi and Jabbra, 2001, p. 5). Indeed, socio-cultural context plays an important role in fighting negative phenomena such as corruption. In practical terms, a system with a meritocratic bureaucracy and an administration concerned with accountability, transparency, openness and inclusion is much more effective in fighting corruption and, at the same time, in promoting high ethical standards and public values. What is the state of play of the prevention and fight against corruption? How to effectively address corruption? Are there any good practices which could they be implemented in different societal and organizational contexts? How can national anticorruption policies targeting different forms of corruption be improved? 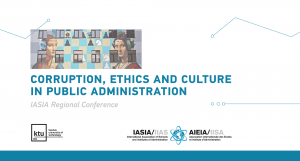 What are discourses on corruption perceptions in different cultures? How do open and subtle corruption forms happen in institutional contexts? To which extent and how can ethical standards’ frameworks influence the concrete behavior of public servants? How can public administration institutions empower their employees to provide high quality services and refrain from challenges in corrupt environments? What influences (im)moral decision-making and action in public organizations? Can administrative culture be taught to public servants, and if yes, through which means? Proposals will be evaluated by the Conference Scientific Committee, which could ask submitters to make reasonable adjustments. The conference provisional program will be published online in January. The accepted and presented full papers will be considered for publication either in International Journal of Public Leadership (Emerald Publishing, Emerging Sources Citation Index (Clarivate Analytics) or Public Management and Administration (SCOPUS). Authors willing to publish their paper will have to submit the final paper for review by 31 August 2019 stating the title of the journal for which they would like to be considered. Tiihonen, S. (2003). Central Government Corruption in Historical Perspective. In: Tiihonen, S. (ed. ), The History of Corruption in Central Government (p. 1-36). Amsterdam: IOS Press. Caiden, G.E. (2001). Corruption and Governance. In: Caiden, G.E., Dwivedi, O.P and Jabbra, J. (eds. ), Where Corruption Lives (p. 15-38). Bloomfield: Kumarian Press, Inc.
 CNFPT and IASIA (2018). Charter for Civil Servants on the Meaning and Purpose of Public Action. Paris: CNFPT. Caiden, G.E. Dwivedi, O.P. and Jabbra, J. (2001). Introduction. In: Caiden, G.E., Dwivedi, O.P and Jabbra, J. (eds. ), Where Corruption Lives (p. 15-38). Bloomfield: Kumarian Press, Inc.